This is a big church. 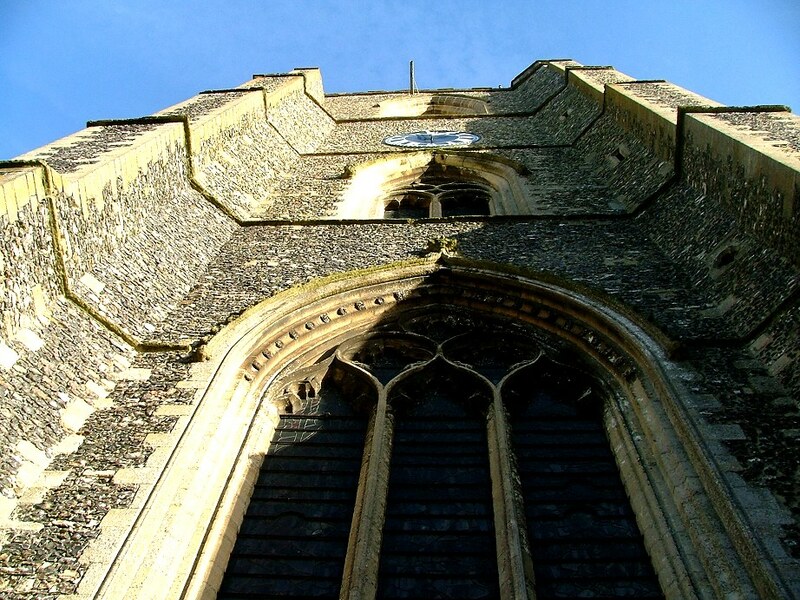 The vast, blockish tower is a landmark for miles around, and the church itself is more than fifty metres long. In almost any other county, St Andrew would be the biggest. 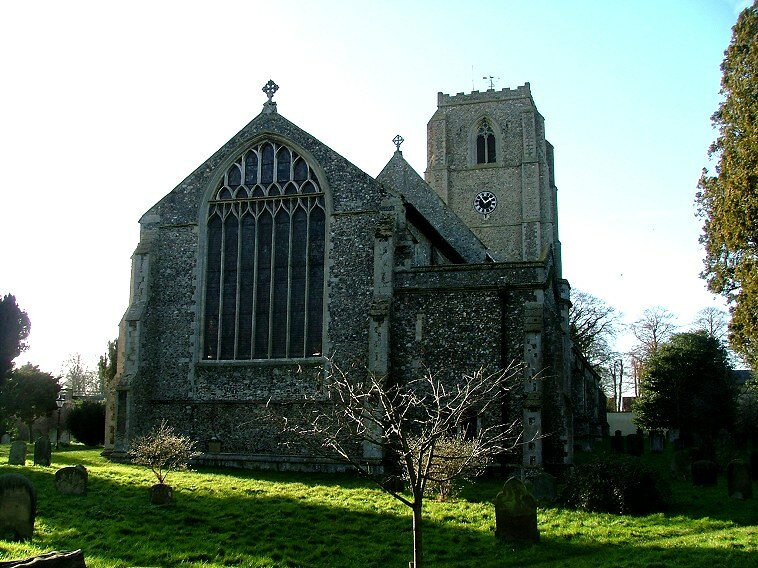 But this is Norfolk, and Hingham church must take its place in the ranks behind a dozen or so that are bigger. 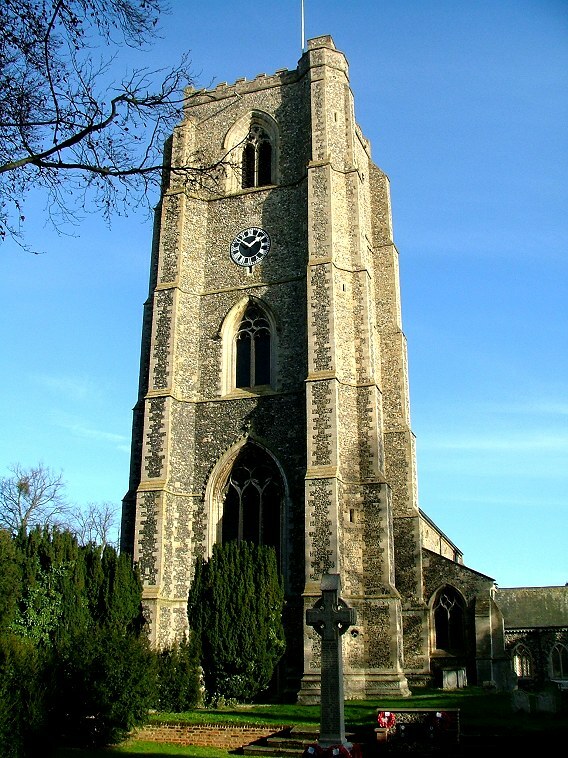 In East Anglia, it is not unusual to find a huge church which was all built in one campaign. 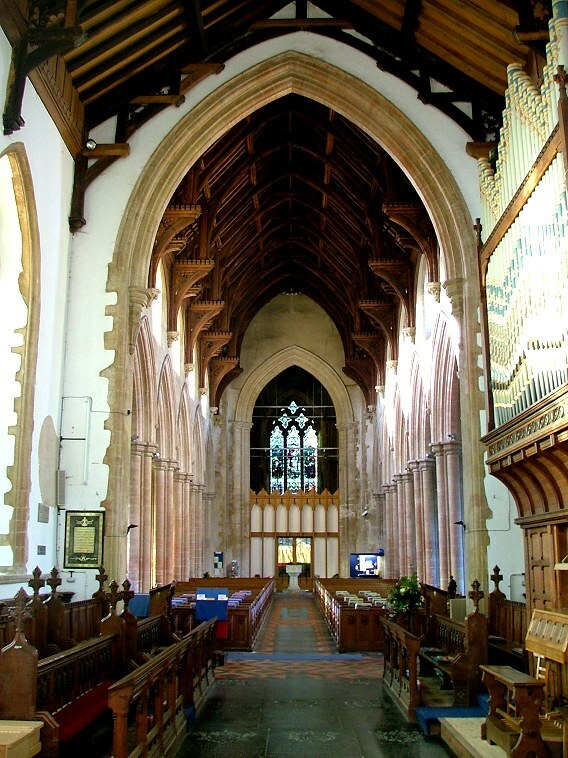 Perhaps the most famous are Salle, Lavenham and Southwold. 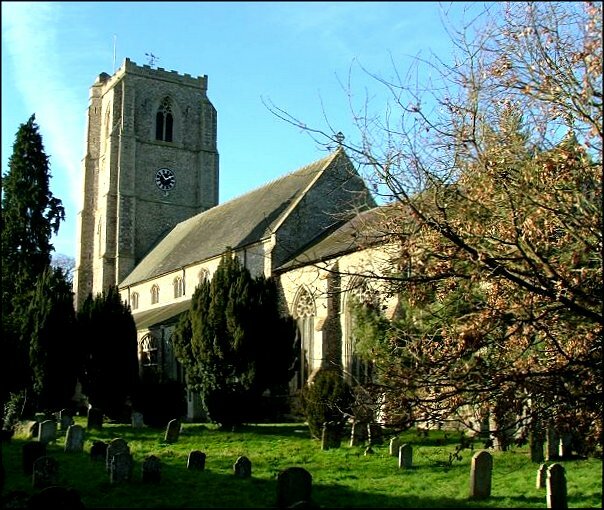 This is true here too, but Hingham is different in that it dates from a century earlier than those other great churches. It is possible to date the building quite precisely. 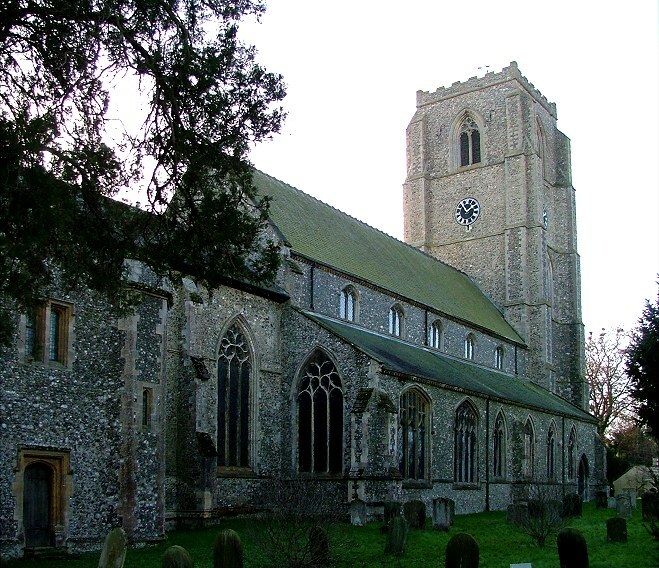 We know that the bulk of it was in place before the death of the Rector Remigius de Hethersett in 1359; but there are elements of the emerging Perpendicular style among the otherwise Decorated features, telling us that it was probably after the Black Death had dispatched more than half the Norfolk population in the late 1340s. 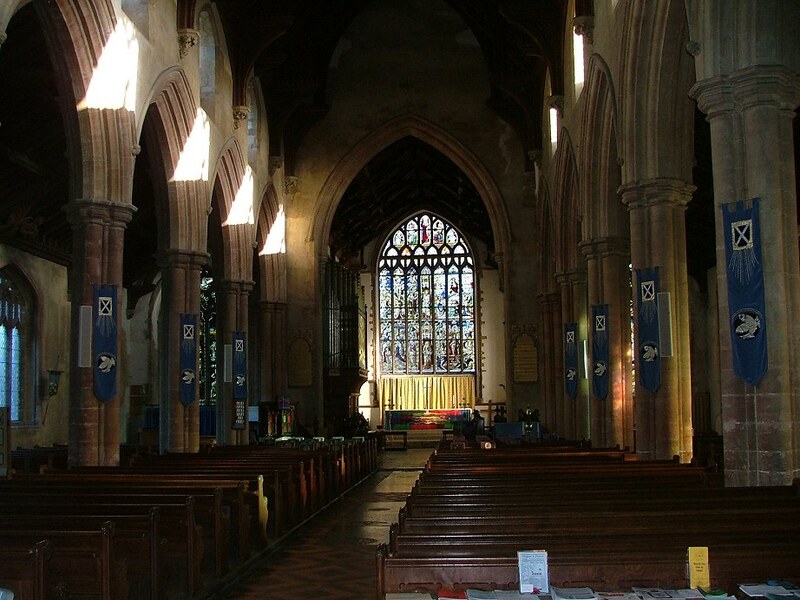 We can reasonably assume that most of what we see here, then, dates from a single decade, the 1350s. Hingham today is little more than a large village. 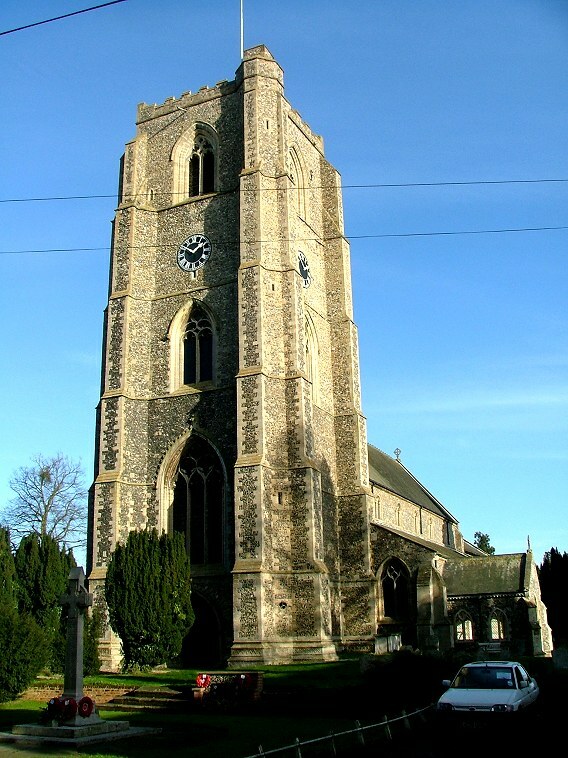 But in the past it was a market town, and Remigius de Hethersett built a church that befits a place of some importance. The Victorians restored St Andrew with the same enthusiasm, and this is a thoroughly urban building, both inside and out. 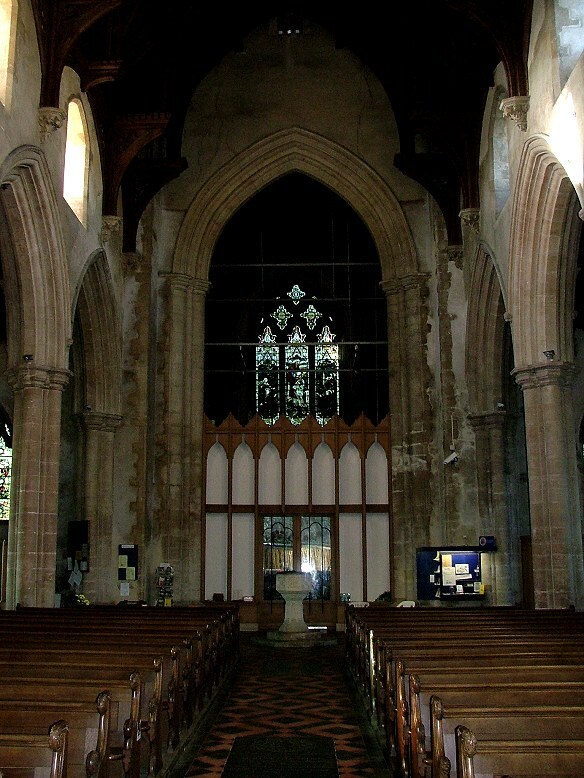 Inside, it must be said, the church has rather less character than out; the 19th century has left an anonymous atmosphere, and the church could be in any large town; but it is not without interest. Presumably lost in the Victorian clear-out was the classical font cover seen here by Richard Hart in 1842. It was remarkable for having a palindromic inscription. 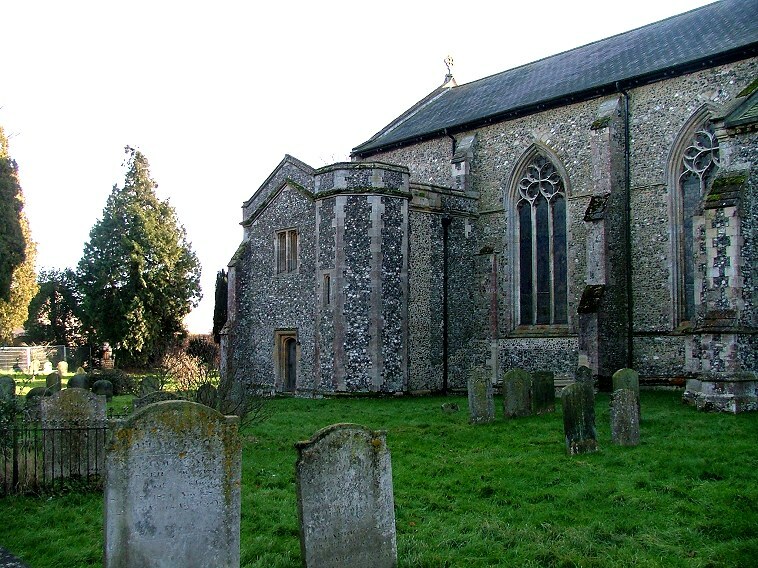 There is another at Knapton in the far north-east of Norfolk, and that one reads NIYON ANOMHMA MH MONAN OYIN - 'wash not only my face but my sins as well' - and so the one here probably did as well. I suppose that it might even be the same font cover. 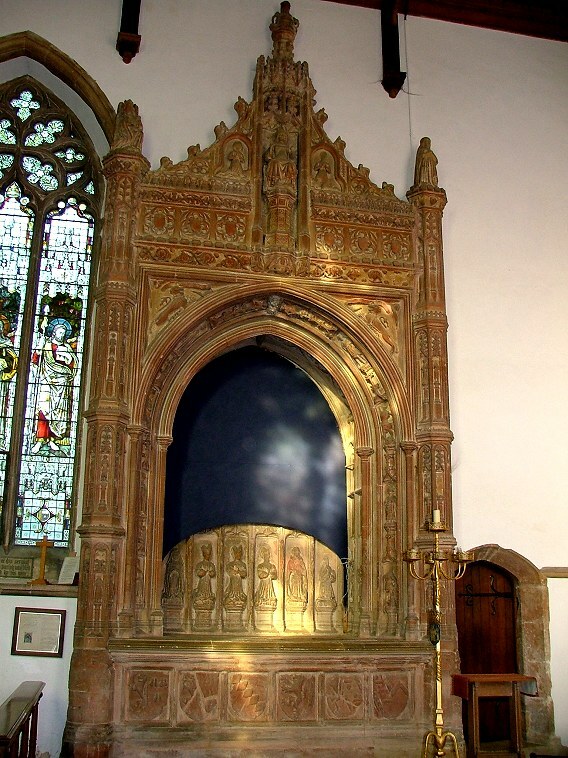 Perhaps the best single feature of Hingham church today is the huge Morley tomb in the north wall of the sanctuary, a great towering edifice that incorporates an Easter sepulchre at the base. 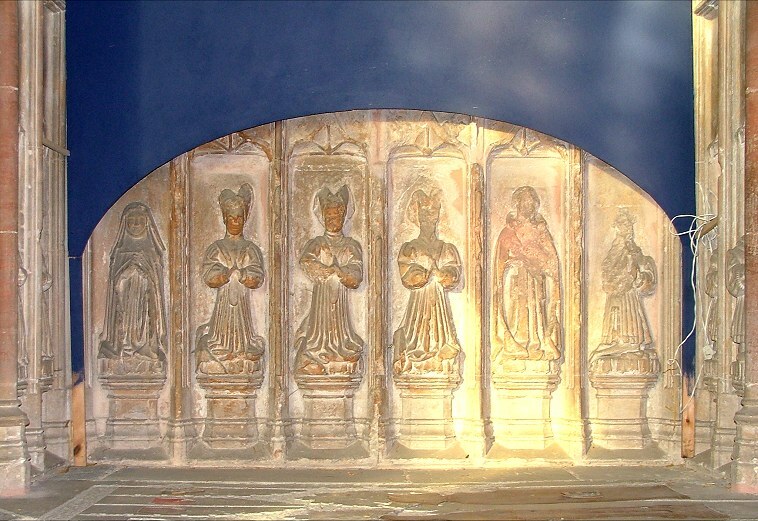 It dates from the middle of the 15th century, a period we know well in East Anglia; and yet the red stone from which it is carved creates an unfamiliarity. 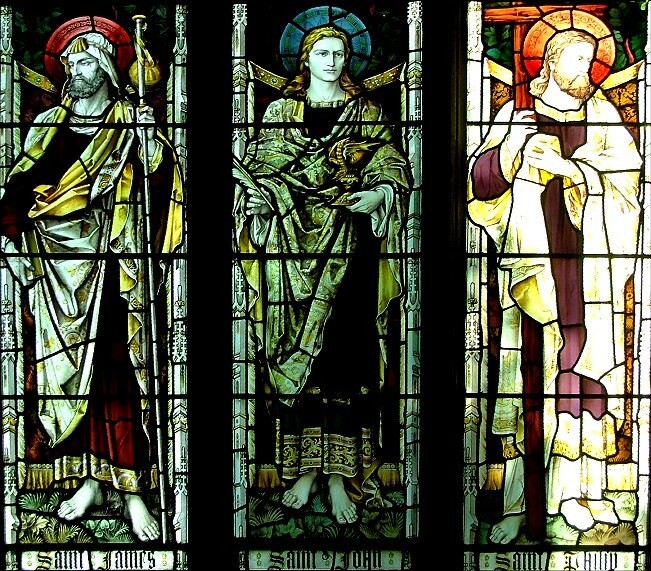 Despite its size, it is not an arrogant piece; the Morleys kneel facing outward in relief, among the weepers, with the Saints above. 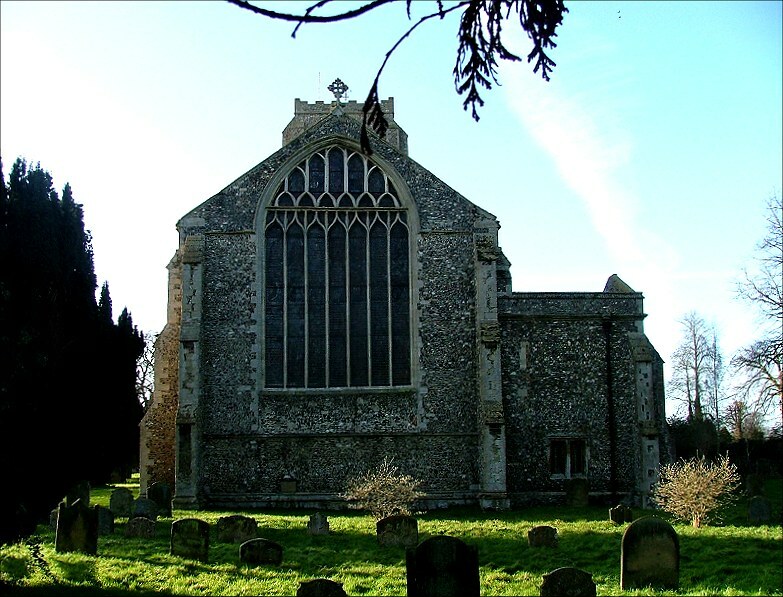 Pevsner thought it was the finest of its type in England. For some reason that I don't understand the upper part of the alcove is now covered in blue canvas. Perhaps this is to protect it from the light. 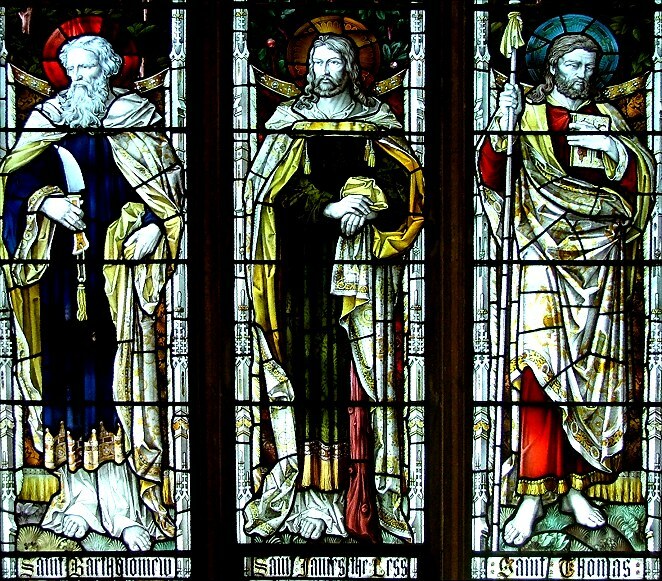 The sheer size of the piece means that it even puts the apostles, life-size in the north and south windows, in their place. Perhaps that is why they all look so miserable and serious. 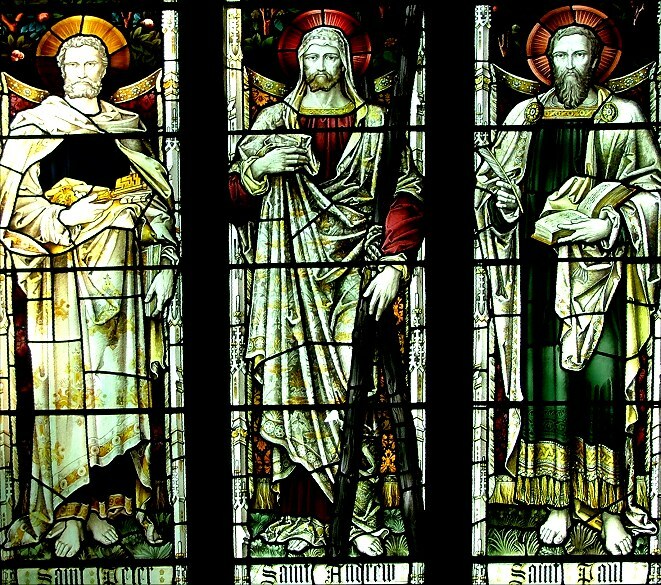 I can accept it from St Paul, but I'd always thought of St Peter as a fairly jolly man. He isn't very jolly here, I'm afraid. When everything architectural is so cleverly to scale, it is sometimes hard to see just how big features are. 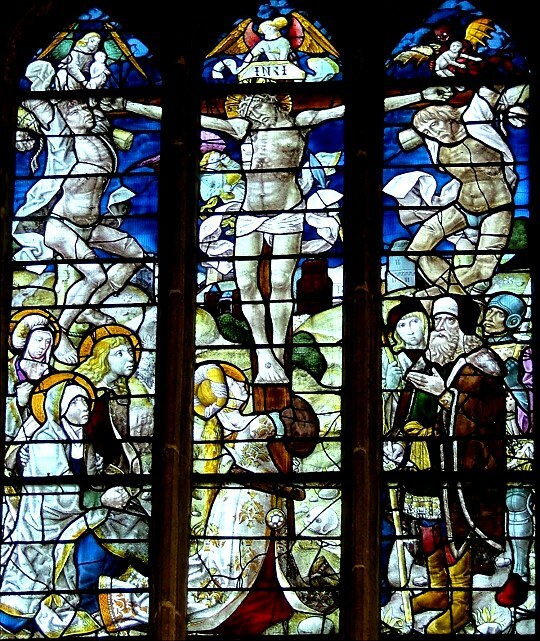 The east window here, for example; it doesn't overwhelm, and yet it is one of the largest in England. 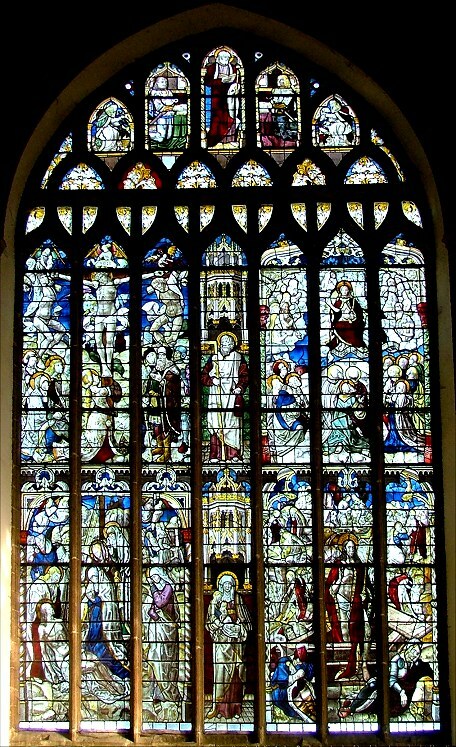 It is filled with continental glass that originally came from about half a dozen separate windows, probably all in the same German monastery. The recomposition here is slightly uneasy, without any real focus. 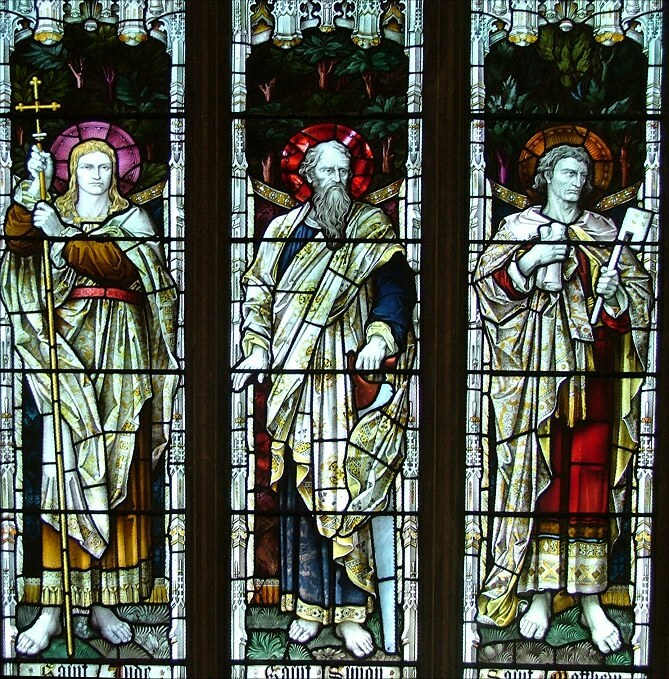 The glass was the gift of the Wodehouse family of Kimberley, who filled the chancel windows there with more of the same. 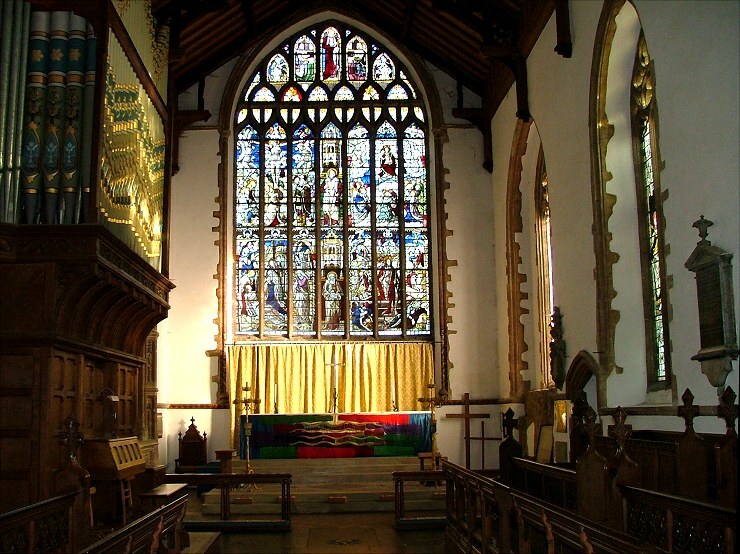 It probably all came originally from a Norwich merchant, JC Hampp, who catered for late 18th and early 19th century tastes by importing glass from monasteries closed by war and revolution in Europe, and selling it to rich families who wished to appear antiquarian-minded. The most famous person commemorated at Hingham is not from the village at all. 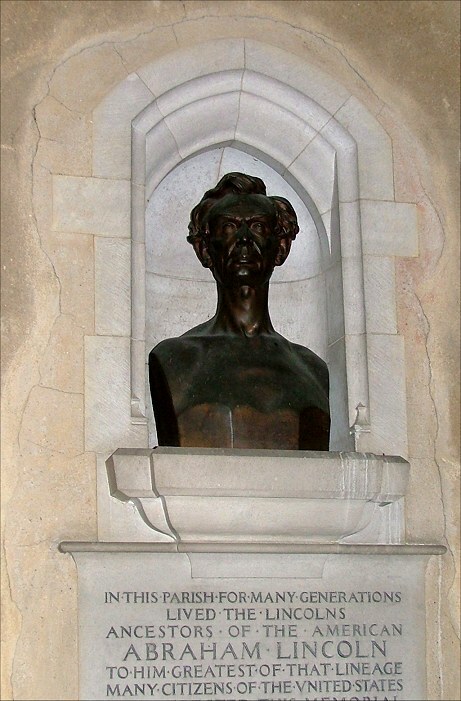 In a reconstructed alcove in the north aisle there is a bust of Abraham Lincoln. The Lincolns left Hingham in the middle of the 17th century, a good 200 years before he became president, but his origins are remembered here. Heading back down this vast, well-kept building, I was struck by the sound of my own footsteps. 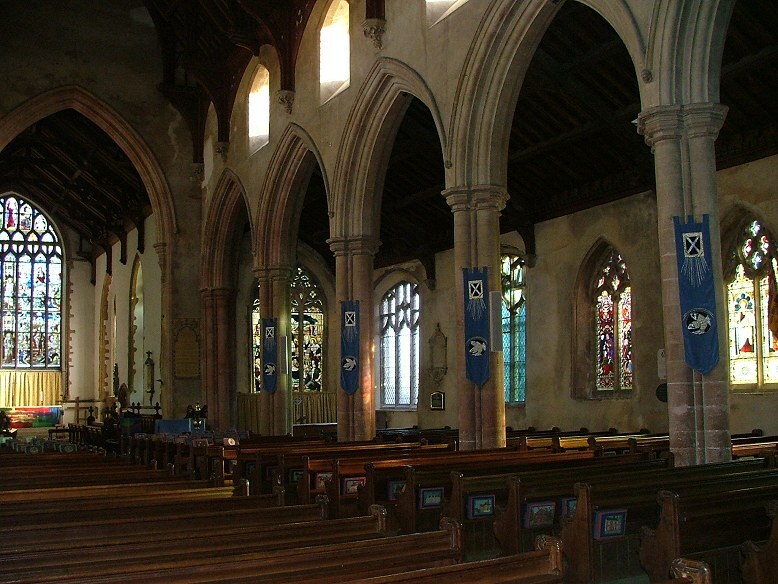 The church is so tall, so long, that the echo they produce is familiar from walking through cathedrals. What a fine acoustic for singing this building must have.